Seating specialist Your Mobility has reported OT Show success, with healthcare professionals giving positive feedback about the company’s new seating range. 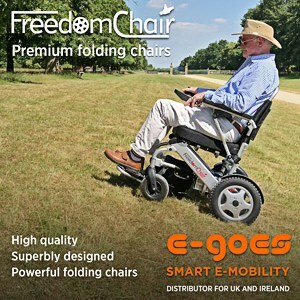 Based in Monmouth, Wales, Your Mobility supplies a range of strong, lightweight and portable seating options for elderly and disabled people. Explaining why the company decided to attend the OT Show this year, Director of Your Mobility Howard Smith said: “I am a great believer that Occupational Therapists are very influential as to what products are recommended or prescribed to help elderly and disabled people live more comfortably. “Attending the OT show was part of a new promotional campaign aimed at raising awareness and product knowledge to Occupational Therapists and other healthcare professionals. Alongside its product showcase, Your Mobility’s Chelsea Easy Glide chair was judged by a panel of occupational therapists, who said that it was one of the best personal independent products on display at the 2018 OT Show. From the success of the Chelsea Easy Glide range, Your Mobility is looking to expand as Howard explained that the company is now looking to recruit additional Sales Agents to address the growing demand for the chair range. Your Mobility National Product Support Manager Diane Smith said: “When designing and specifying our chairs we take into account the needs of the user, the carer and the setting to ensure the best solution is achieved because we believe there is so much more to a chair than just being a seat. Diane added that Your Mobility aims to deliver its products within 72 hours of ordering to help people receive the vital specialist equipment they need as quickly as possible. She also noted that the company now offers a rental option for short-term needs, which aims to tackle the issue of delayed transfers of care in hospitals.